Pacific Avenue residents show the Toronto Star’s Ken Faught their opposition to the Kingsway Pacific Bingo plan to open a large Bingo hall in a former Loblaws. Image: Ken Faught / Toronto Star / Toronto Public Library, Baldwin Collection, Item TSPA 0011943f. Admittedly, one of my favourite articles in the last little while has been one that was run in Toronto Life called “People with their arms crossed in front of things they’re against: A taxonomy of the Star’s favourite visual cliché“. To be certain, it’s a light and fluffy piece, but I was happy that someone did put it out there. The arms-crossed-and-scowl (or look of deep concern) visual language that communicates opposition is common to newspapers all over. 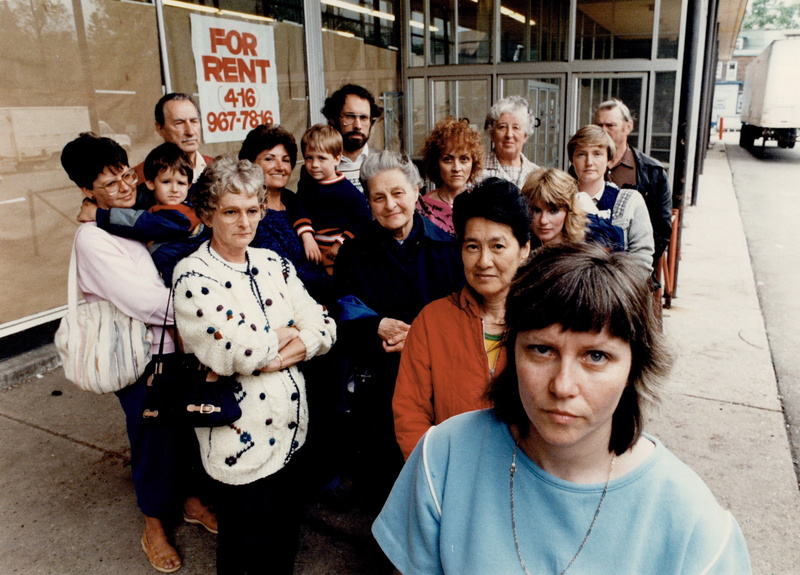 In May 1986, handful of residents in the vicinity of Pacific Avenue in Toronto’s Junction neighbourhood gathered to register their opposition to Kingsway Pacific Bingo to open a new hall in the recently closed Loblaws near Dundas West. With opposition reminiscent of Charlotte Whitton’s in Ottawa during the 1950s,1Herbert Manning, “Is Bingo Bad For Your Town? Here’s What It’s Done In Ottawa,” Maclean’s, August 6, 1955, 10-13, 39-42. opponents cited traffic concerns, challenge the community’s revitalization, generate crime (“with muggers lying in wait for big winners”), and, of course, that toothiest of all community saws, it was “going to drop property values down.” To one neighbour, that there was a store at all was “an anomaly” and it would be best to demolish the store entirely and make sure that the neighbourhood was “entirely residential.” Another neighbour chimed in, noting that parking was already tight in the area, so Bingo players using the 108 spaces in the lot outside of the store would make matters worse. For its own part, the Bingo proponents had support from others and stressed the donations that would be made to local charities. The opponents, suffice to say, were unmoved by the promise of donations to local causes.2William Clark, “Bingo war brewing in Toronto’s west end,” Toronto Star, May 22, 1986, A6; Brian McAndrew, “Bingo angers group,” Toronto Star, May 25, 1986, H6. During the first week of July, the City’s Committee of Adjustment allowed the Bingo hall project to commence. Angered by the decision, the newly-formed Junction-High Park Ratepayers’ Association vowed to appeal the decision to the Ontario Municipal Board. Ward 1 councillor William Boytchuk agreed to present the city’s solicitors with the case because the Planning Department was opposed to the application.3William Clark, “Angry residents to fight plans for new bingo hall,” Toronto Star, July 12, 1986, B8. We’re not trying to be down on them (the bingo operators). It’s just that it’s a nice community and I don’t see that it (the bingo hall) is going to do anything for the community.4Joyce Pritchard, acting president Junction-High Park Ratepayers’ Association, as quoted in Clark, July 12, 1986. True to their word, the ratepayers’ association appealed the decision with the OMB. After the hearing that Fall, the province’s appeal board handed down its decision: the bingo hall, as outlined in the submitted plan, was denied. The Board’s decision was made on the basis of the original plan, which projected 1,100 players. At the hearing, the bingo hall proponents presented an amended plan that projected only 750 players. For its own part, the City was opposed to the bingo hall, and its lawyer asked the board to reject the plan because it did not provide enough parking spaces to meet the requirements outlined in the bylaws. This left the charitable bingo with two courses of action: bring the smaller revised plan to the Committee of Adjustment or appeal the OMB decision to the courts.5Paul Watson, “Municipal board halts proposal for bingo in vacant supermarket,” Toronto Star, October 25, 1986, A12. The hall’s proponents decided to present the amended 750-player plan to the Committee of Adjustment shortly afterwards. 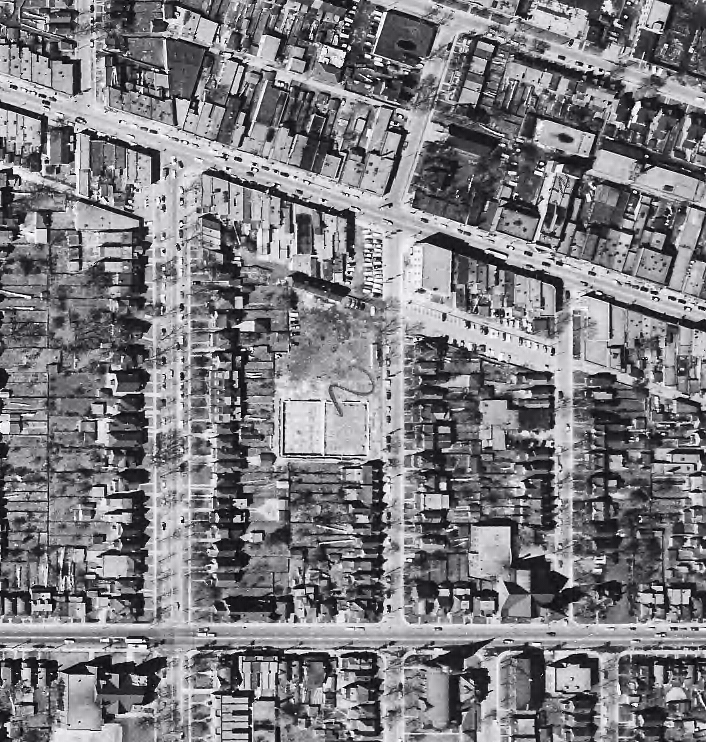 The well, it seems, had long been poisoned and the City moved quickly to pass an interim control bylaw to prevent them from “seeking municipal board approval for the plan.” According to the Star, this meant that they would have to successfully challenge the bylaw before being able to appeal the decision to the OMB.6”Toronto stalls proposal to build new bingo hall, Toronto Star, January 20, 1987, A6. From there, it appears that the matter was definitely laid to rest. 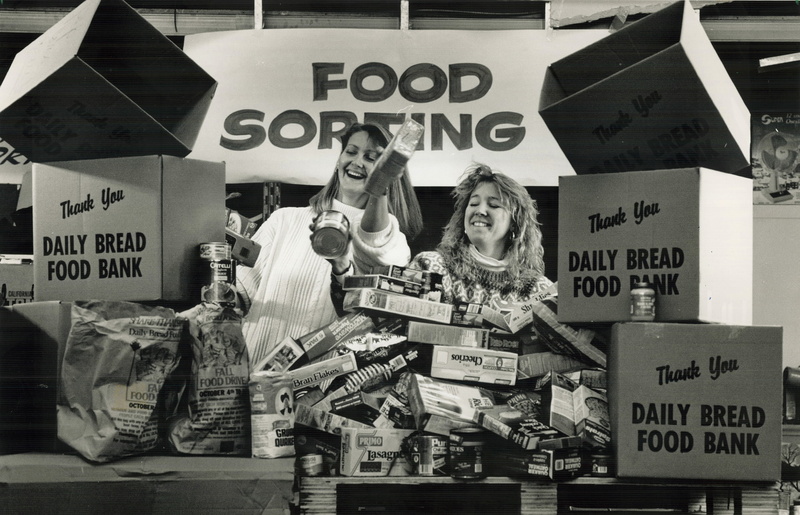 Daily Bread Food Bank volunteers sort food during the Thanksgiving drive in 1989. Image: Andrew Stawicki / Toronto Star / Toronto Public Library, Baldwin Collection, Item TSPA 0007864f. While the threat of bingo had been put to rest, a different charitable use had been found for the vacant Loblaws: the Daily Bread Food Bank’s warehouse. In April 1987, the Toronto Star reported that as the result of the Spirit of Sharing Spring Food Drive, volunteers at the facility were being kept busy with the overwhelming response of Torontonians who opened their cupboards for the Spring season. Donations were made at locations across the city and brought to the Pacific Avenue facility. The cause was obviously acceptable to the surrounding community, as a parade of children from the Mountainview Alternative School had numerous donations added along its route.7”Account’s in the black at the Food Bank,” Toronto Star, April 6, 1987, A1; Dana Flavelle, “School kids tow food-filled wagons as campaign to help 60,000 begins,” Toronto Star, April 6, 1987, A6. A 1991 advertisement for the Spring drive. Source: Toronto Star, March 25, 1991, D3. Brownies with a stack of empty boxes that were to be filled with donated food. 1988. Image: Andrew Stawicki / Toronto Star / Toronto Public Library, Baldwin Collection, Item TSPA 0008215f. Warehouse manager Barry Davidson tallies the donations in 1987. Image: Bernard Weil / Toronto Star / Toronto Public Library, Baldwin Collection, Item TSPA 0007866f. The growth and development of food banks continued in Toronto as it had elsewhere in Canada and by the turn of the century, it was clear that the Pacific Avenue warehouse had become less satisfactory for a number of reasons. Aside from the size of the building, that the organization did not own the Pacific Avenue store had become an issue. To that end, in 2001, Daily Bread purchased the old Continental Group facility in Etobicoke, on New Toronto street, just off Islington, and had planned to move in by February 2002.8”Hunger’s Home,” Toronto Star, December 27, 2001, A44; “Restock the food shelf,” Toronto Star, March 22, 2002, A26. Since 2006,9So far as I have been able to make out. Though I’d be happy to be corrected if not. it has been home to Tim & Sue’s No Frills. The folks at BlogTO have included it among Toronto’s best No Frills, for what it’s worth. The building has since returned to its original use as a grocery store. This time, as Tim & Sue’s No Frills, one of the Loblaw discount brands. Image: Google Maps. 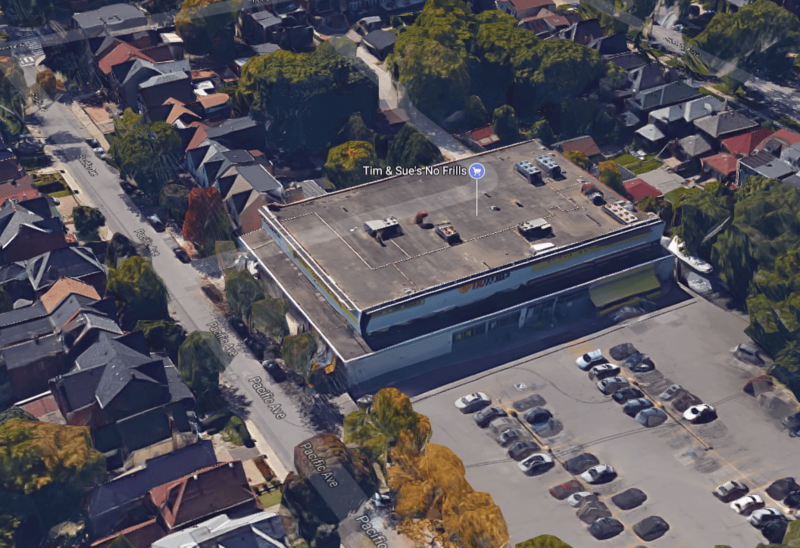 In terms of the “anomaly” of commercial property referred to above by one of the bingo hall’s opponents, the Loblaw’s on Pacific Avenue was officially opened on November 29, 1956. Once again, as I am not currently in Toronto, I do not have ready access to the Council Minutes to write about the politics that might have occurred behind its appearance in the neighbourhood. I was not able to find anything reported in the Star or Globe to suggest that there was much of any community opposition to the grocer’s appearance, however. The new grocery store opened on November 29, 1956. Source: Toronto Star, November 28, 1956, 11. The grocery store business has never been one marked by a dull stability. That would go double when the relationship between the urban fabric, transportation, and consumer preferences are taken into consideration. By the mid-1980s, it was clear that the outlet had seen better days. At a 1984 shareholders’ meeting of George Weston Ltd., a longtime shareholder who identified herself as H.D. Ross complained about the flagging level of upkeep the Pacific Avenue store was receiving. She also complained about the company’s new orange and brown colour scheme and the level of salt in their processed foods. The last two complaints aside, it does appear that the store had been neglected somewhat by the company before its closure in 1985.10Pat Brennan. “Food giant Weston told it needs to seat housewives as directors,” Toronto Star, May 8, 1984, B3. The new Loblaws under construction. Image: City of Toronto Archives, Series 12, 1956, Item 149. As to the winner of the 1957 Pontiac in the ad? A Mr. Alan Paton of 69 Grenadier Road drove off with the grand opening prize.11Toronto Star, January 31, 1957, 19. The specific model of Pontiac is never mentioned in the ads and I acknowledge that I don’t know anywhere enough about car models to really take a good stab at it. The Wikipedia article identifies a few different ones. An example of a 1956 Pontiac (?) to illustrate. 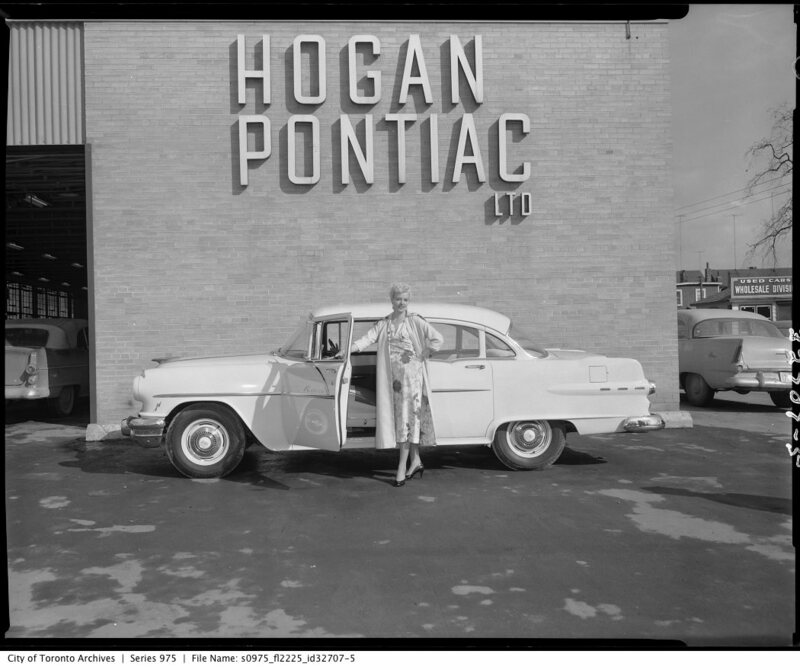 Still going today as a Chevy-Buick-GMC dealer, Hogan Pontiac was, for the record, located at 348 Danforth and was a spectacular looking dealership by the 1960s. This photograph was not taken at the dealership, but rather in front of its service department on Broadview near Mortimer. The old site on Danforth, which had become Peter Burdon auto sales in the interim, has been home since 1985 to Carrot Common. Image taken March 26, 1956. Image: City of Toronto Archives, Fonds 1653, Series 975, File 2225, Item 5. 1. ↥ Herbert Manning, “Is Bingo Bad For Your Town? Here’s What It’s Done In Ottawa,” Maclean’s, August 6, 1955, 10-13, 39-42. 2. ↥ William Clark, “Bingo war brewing in Toronto’s west end,” Toronto Star, May 22, 1986, A6; Brian McAndrew, “Bingo angers group,” Toronto Star, May 25, 1986, H6. 3. ↥ William Clark, “Angry residents to fight plans for new bingo hall,” Toronto Star, July 12, 1986, B8. 4. ↥ Joyce Pritchard, acting president Junction-High Park Ratepayers’ Association, as quoted in Clark, July 12, 1986. 5. ↥ Paul Watson, “Municipal board halts proposal for bingo in vacant supermarket,” Toronto Star, October 25, 1986, A12. 6. ↥ ”Toronto stalls proposal to build new bingo hall, Toronto Star, January 20, 1987, A6. 7. ↥ ”Account’s in the black at the Food Bank,” Toronto Star, April 6, 1987, A1; Dana Flavelle, “School kids tow food-filled wagons as campaign to help 60,000 begins,” Toronto Star, April 6, 1987, A6. 8. ↥ ”Hunger’s Home,” Toronto Star, December 27, 2001, A44; “Restock the food shelf,” Toronto Star, March 22, 2002, A26. 9. ↥ So far as I have been able to make out. Though I’d be happy to be corrected if not. 10. ↥ Pat Brennan. “Food giant Weston told it needs to seat housewives as directors,” Toronto Star, May 8, 1984, B3. 11. ↥ Toronto Star, January 31, 1957, 19. The specific model of Pontiac is never mentioned in the ads and I acknowledge that I don’t know anywhere enough about car models to really take a good stab at it. The Wikipedia article identifies a few different ones. Hi Chris, I love your site. Can you correct the caption for the Hogan photo? It was actually taken at Broadview and Mortimer. Please see Hogan Motors website link. thanks https://hoganchev.wordpress.com/2015/05/13/vintage-hogan-photos/ . I know this as I was involved in the development of Carrot Common being a founding member of The Big Carrot Natural Market. At that time, 1985 the car dealership was called Peter Burton. https://thebigcarrot.ca/about-us/carrot-common-green-roof/carrot-common-gallery/ . Keep up the good work! Thank-you so much for the kind words and the correction! I’ve gone ahead and changed the caption.